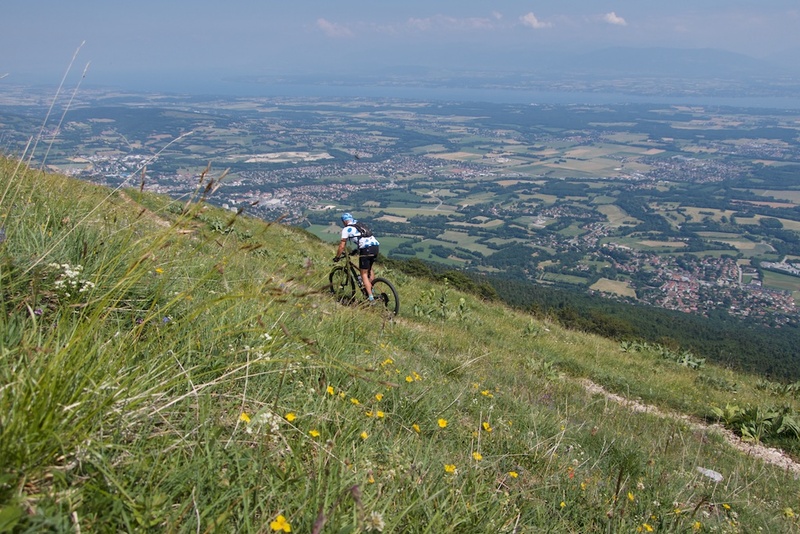 The Monts Jura is the anticlinal* ridge in the Haute-Chaîne of the Jura mountains overlooking the Geneva basin. 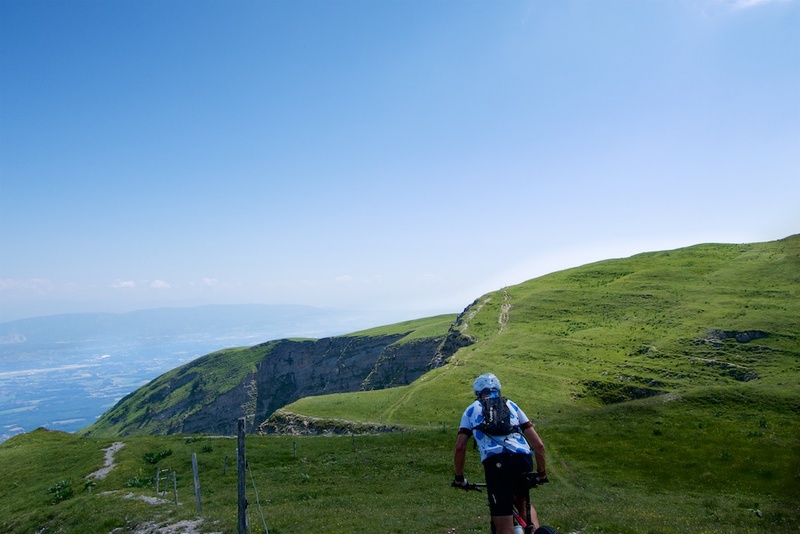 It includes the highest summits in the entire Jura Mountain range. 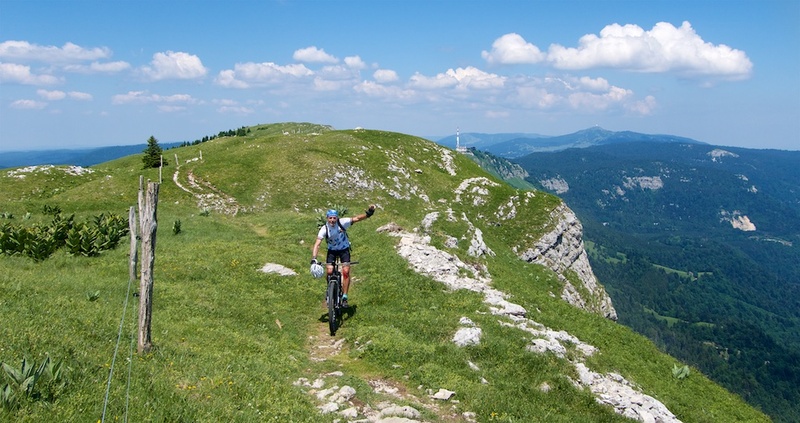 This is a great mountain bike ride up to and along this impressive section of the Juras. But be warned, after a long, fully rideable ascent, the spectacular ridge stretch requires some tough hiking. Yikes, next stop: up that mound. 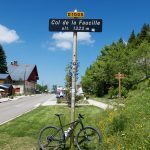 Col de la Faucille is one of the best known paved climbs near Geneva. But, for me, it can sometimes be too busy with both fast cars and trucks. So my first goal in this ride was to climb to the col primarily on gravel forest roads and hiking trails (see map at bottom). 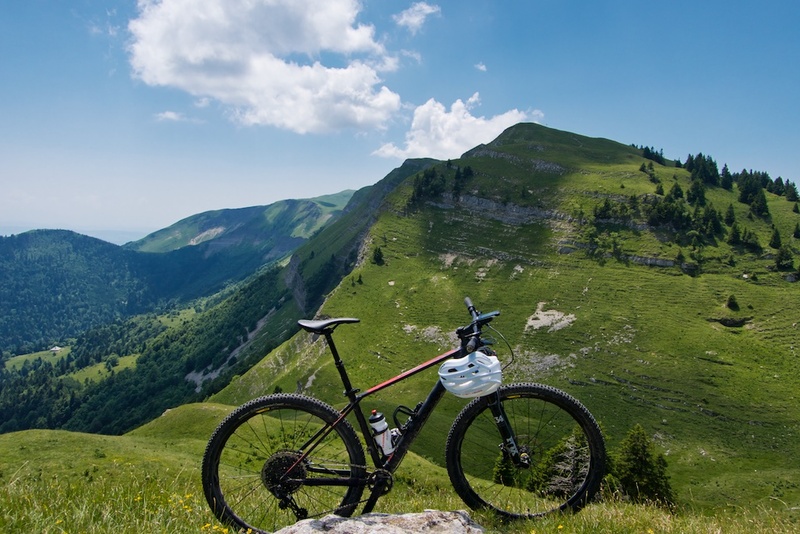 For the col-hunters, note this route also reaches Pas de l’Echine (1590m) – labeled on map. Starting in Gex, almost immediately I joined a good quality trail. This soon connects with a gravel forestry road and the next several kilometres proceeded up through a quiet forest. 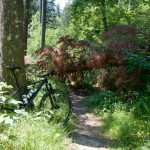 At approximately 1100 metres, I briefly took a narrow, but ride-able hiking trail to link to the Chalet de la Quible (1172m). 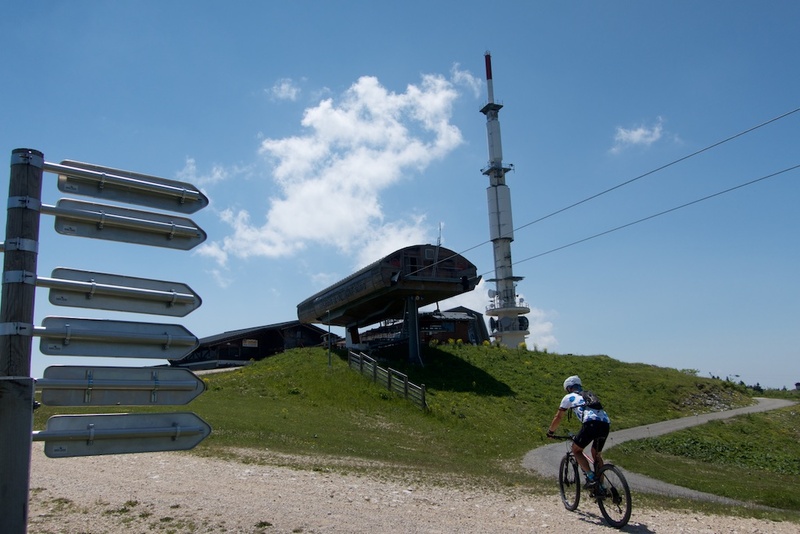 From here are clear views of the communication tower atop Petit Montrond – I’d be visiting it soon. Beyond the chalet, a farm road leads to one of the final hairpins on the paved route to Col de la Faucille (1323m), so I briefly joined the main road. 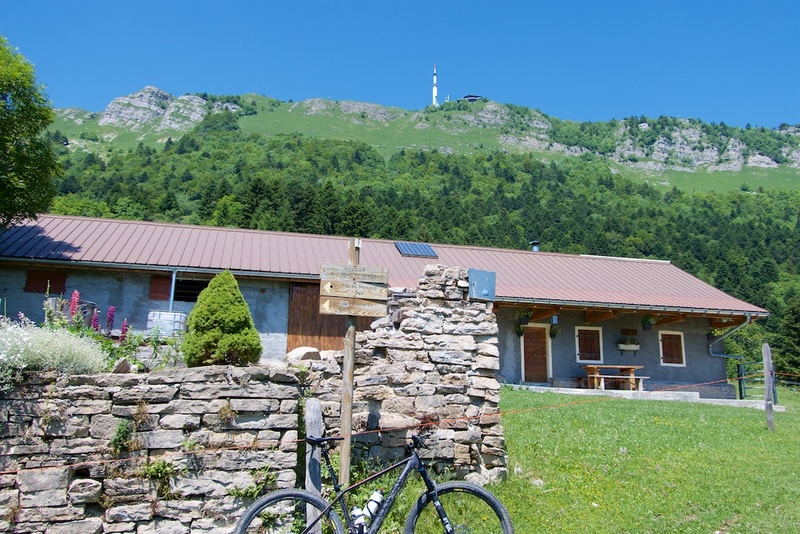 After Col de la Faucille I turned into the Monts Jura ski station. Here, if you follow my route carefully, I briefly jump onto a gravel/grass trail that then turns into a perfectly paved little road all the way to Petit Mont Rond. It is paved all the way to top and the telecommunications tower at 1534 metres. This would make it perhaps the 3rd highest paved road in the Juras. 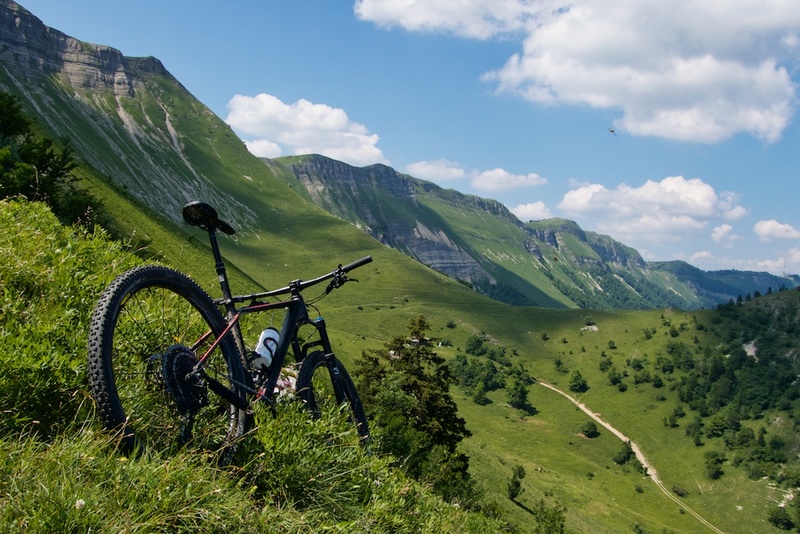 See here for the Ten Highest Paved Roads in the Jura Mountains (I now need to update it!). From here, the road ends and it gets tough following a hiking trail along the edge of the cliffs. It basically goes up/down/up/down to peak after peak. 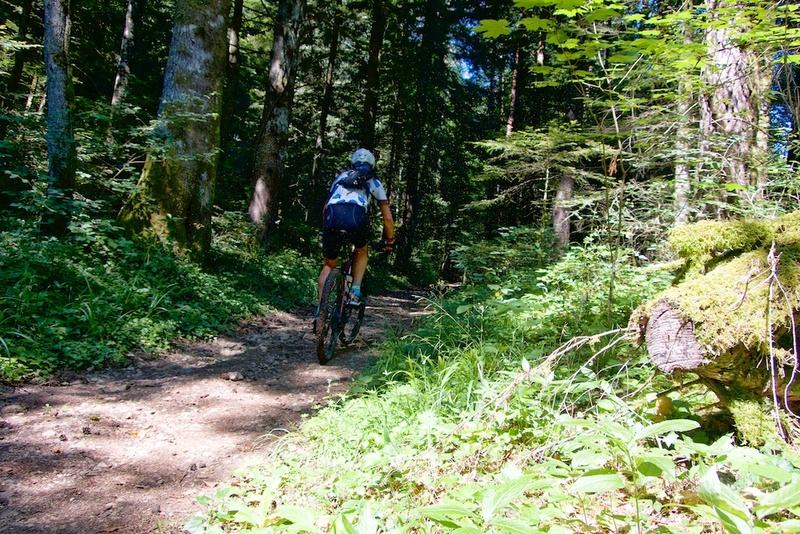 and take the gravel descent – very fun. See here (in post I climbed Crozet, but you could do the reverse). But I was excited to follow the ridge and visit these high peaks with a bike. After reaching Grand Montrond (1596m), and a couple of other peaks, my high point would be Colomby de Gex – at 1688 metres the third highest point in the Juras. The two highest are just a little further along and only a touch higher: Crêt de la Neige (1720m) and Le Reculet (1718m) – maybe next time. It’s quite an amazing place. To descend off the ridge, my route initially seemed crazy, following a difficult to find little hiking trail but it was not dangerous, and soon led into a little valley below the ridge. Still high. Taken from roughly same altitude as Col de la Faucille. Finally, I linked up with a series of farm/forestry roads on Mont Chanais, quickly descending back to Gex. The entire loop is only 35 kilometres, but it took me a LONG time. As I told a friend, I found the ridge ups and downs more difficulty than the initial climb of obver a 1000 metres. Quiet, spectacular, challenging, some hiking. Too much fun.